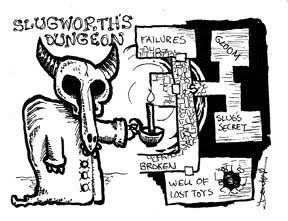 Slugworth is perfectly willing to show you his dungeon. For each room that Slugworth shows you, revealing the plans he and his master have spun and revealing their secrets, something happens. After the well, a swarm of inimical lost toys creeps out and silently follows the party through the dungeon. In the room of failures, the are shown horrors that shake them to their souls. Slug's Secret reveals that perfidy of those who hired the party in the first place. And in the gloom, where sign and wisdom fail, he strikes. I always wondered what Willy Wonka's arch rival looked like. Wow, I totally forgot about Slugworth in Willy Wonka. :) And I read that about 4 months ago too.